There’s nothing more frustrating than arriving at your holiday destination only to be greeted by queues at the car hire pick-up desk. But now new research from Which? Travel has showcased which hire companies can help get your holiday off to the best start, and also those that are more likely to keep you waiting. According to the research, opting for the cheaper car hire options can increase the likelihood of having to queue, partly as a consequence of excessive upselling techniques used by staff. Upsold items can include sat-navs and child car seats, as well as excess insurance policies to enhance the cover that is provided as standard. The good news for customers is that these extras are often not required, as the majority of airlines will allow you to put a car seat in the hold for free, while your smartphone can easily double up as a sat-nav. For car hire excess insurance – which covers the excess you would need to pay should your hire car be damaged or stolen – it’s worth looking online before travelling as cover can be purchased for significantly less than at the check-in desk. Holidaymakers should shop around for the best options, especially if they intend to travel numerous times as annual cover is also available. Customers also said that check-in desks were not staffed adequately during peak times, further adding to the wait. More than one in four customers using Budget had to wait more than half an hour before being able to drive away. Compare that with Alamo, where more than 90% of customers were en-route to their resort within 30 minutes of reaching the check-in desk. 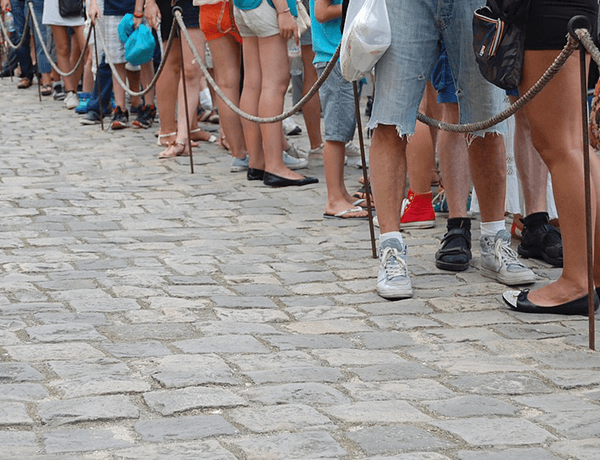 Of the companies with the longest queue times, all are described as low-cost brands with Goldcar (owned by Europcar), Budget and Hertz low-priced brand Firefly the worst offenders. Auto Reisen, which specialises in car hire in the Canary Islands, was the best performer, with only 13% of customers having to wait for 15 minutes or more. Thrifty also performed well with more than two-thirds of holidaymakers saying they experienced no queue at all. To make sure your experience collecting a hire vehicle is as quick and easy as possible, get a quote in advance for an excess insurance policy, it will soon stop the salesman in his tracks!